Route 66 Scents - Sophisticated Retro? Route 66 is a fairly new Artisan company out of Arizona starting about Nov, 2015. They only sell shaving soap at the moment, but I think might be moving into aftershaves in the future. I see Route 66 has little to virtually no discussion here. I think their products are very good and I like new companies coming into the business. Competition is good for everyone. I know there was a big discussion on the closure of three artisans but this just goes to show that when one door closes, another opens The scent profiles from this company are to me quite complex and strong. In general, the scent will last the entire shave with none totally disappearing, close but not totally. First - a word about performance. So on to the scents. At first I got ginger ale from this but then thought, “NO, it’s Orange soda!” Think Orange Crush. Nailed it. The main scent is Sicilian Blood Orange. I have no clue if Sicilian Oranges are different than California or Florida Oranges but – wow – nailed it. Better yet, this orange scent barely dissipated. I have to admit I really liked the scent of Sweeny Todd and the name rocks. This is another Old Spice emulation with a long list of scents in the description. Boring …. I don’t get this nostalgia thing with about every company I come across just has to try to emulate or pay tribute to Old Spice. Back in the day, it was common, sold in about every grocery store, drug store, and you couldn’t get away from it. The commercials were constantly on TV. It wasn’t expensive, just common. Grandpa used it because it was one of few scents sold. This is a good emulation, not the best, but a dark, deep spice version that to me was very close. And I do know what old spice smelled like if my old brain remembered right. Pretty good, not perfect, but very good. And it lasted with little fade. If you like Old Spice, you probably will like this. Ho hum… another modern “barbership scent”. I usually find barbershop scents (other than GFT Eucris) boring. I was expecting this to be another boring version. I’ve about reached the point that when I read “barbershop” I want to toss the soap. They all smell alike to me. Upon smelling it, I got something different and thought maybe this was the one. Reading the description I saw Orange. There was hope! Unfortunately, the scent disappeared to nothing – about gone. I would call this a lightly scented modern Barbershop. Here is another tobacco scent and it did have a light tobacco scent, not unpleasant at all. But like Barbershop Hop – it just dissipated into virtually nothing. This is another complex scent with 9 notes mentioned. Whoosh – right over my head. I got from it – light chocolate, yes, chocolate. It had good scent strength but chocolate shaving cream scents are not for me. Given the 9 scents and the name, this just confirms to me a lot of different notes mean nothing to me. For someone else, they might get something totally different. This is a ghostly scent - Pleasant but faint. Not much going on here and I can’t describe the scent well as its too complex for me. But, it was pleasing and fading. This one is a ghost of a soap – fading away …. but very pleasant to my nose. Imagine walking into the men’s section of a major department store and walking by the display of men’s colognes and using a tester for scents. A Perfect Gent smelled like a generic men’s contemporary cologne. It could be any one of them. The scent was of reasonable strength and lasted most of the shave. So, I think if you like any of the contemporary men’s colognes, you might like this. I can’t match it to any one in particular as they all smell fairly generic to me but if you smelled it, you would know it. And the scent strength remained fairly well. The name matches the scent very well - a modern gentleman. I have no idea what this specifically smelled like but I know I liked it, another complex scent. I got a light floral with nothing specific; it’s not violets, lilac, or a rose specifically. It is supposed to be herbal with florals. Scent strength remained reasonable, not fading so much. If you like florals, you might like The Black Pearl. I like it. Think floral. Think tart lime and salt. The description talks about plums, apples, hay, jasmine, etc. Nope, I got tart lime and salt, reasonably strong, not bad if you like tart lime. I have no idea where the apples, hay, jasmine, etc. went. I think this is a fruity, light Apple Juice with a reasonable strength that mostly remained. I would call this a compliment to Sweeney Todd, one orange, the other apple. In fact, it’s pear and pineapple and a whole bunch of other stuff that would have gone way over my head. Who knew? OK, then I like Pear and Pineapple but I still think it smells like a light, fruity apple juice. It doesn’t matter to me, I liked this a lot. I’m sticking to apple. BTW, “light” does not refer to how long the scent remained. This is another scent that lasted the entire shave. That’s all I got. I know there are two I didn’t try but the Sea & Salt scent had no appeal to me as I don’t like “aquatics”? New word to me! TL;DR? Route 66 scents are good stuff. There is bound to be something in here to please about everyone. I like them. Thank you for taking the time and sharing your thoughts. Thanks grim. I'm liking your style of scent reviews. Straightforward, honest and to the point. Where in AZ is Route 66 located? Does anyone know? 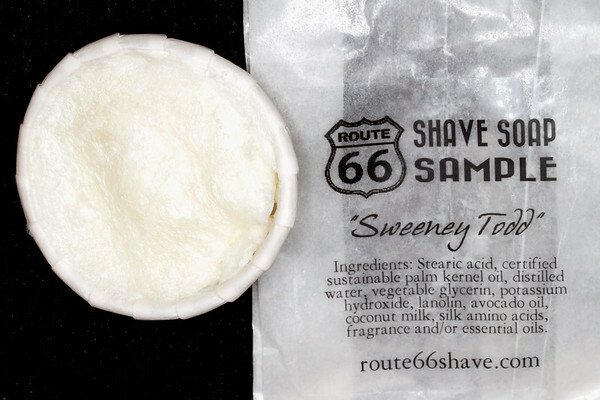 I posted a shout out to Route 66 soaps a few weeks ago. Gr8t soaps! Used Ghist Town yesterday - lovely scent & excellent performance. I'm a huge fan of these soaps. My favorite is Sweeney Todd. (03-24-2016, 01:17 AM)Hobbyist Wrote: Where in AZ is Route 66 located? Does anyone know? She's in Glendale. No storefront or anything though. I did some testing for her on her final pre-production batches. I love the performance, and I hear the production lot is even better than what I used. It's in my top 3 soaps for performance. I tried 4 different scents, 2 of which she completely changed up before production. That being said, I really love the Bourbon Jungle. I get a little bit of the chocolate / cocoa scent myself, but the strongest note to my nose is actually sandalwood. I highly recommend her soaps, and I believe she's offering samples now too.